Pittsburgh Penguins forward Sidney Crosby went into the boards head first in game six against the Washington Capitals. He labored getting back to the bench, yet, wasn’t taken out of the game. In fact he was back out on the ice a little while later. Further proving that the National Hockey League doesn’t care about their players safety enough. At the least, does as little as possible to protect them. Crosby wasn’t pulled by the NHL concussion spotters, which are located in every arena in the league. If you aren’t aware, there are two concussion spotters at every NHL game, however neither is a certified athletic trainer. Also the call to remove a player can’t and doesn’t come either of them. The League has a single league spotter who thankfully is a certified athletic trainer and they make the choice. The explanation of why he wasn’t taken off the ice may be more insane than him not actually being taken of fthe ice. This is what NHL deputy commissioner Bill Daly told USA TODAY Sports’s Kevin Allen. “Depending on the mechanism of injury, ‘slow to get up’ does not trigger mandatory removal… The protocol has to be interpreted literally to mandate a removal. ‘Ice’ as compared to ‘boards’ is in there for a reason. It’s the result of a study on our actual experiences over a number of years. 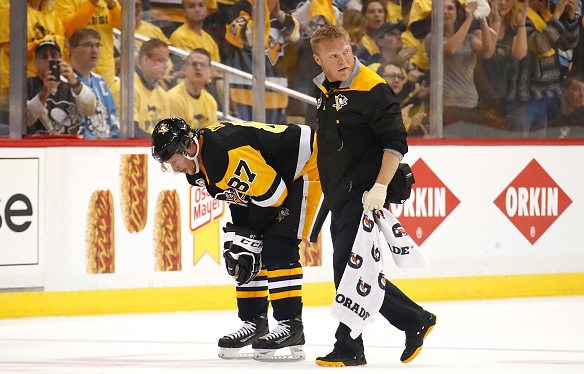 ‘Ice’ has been found to be a predictor of concussions — ‘boards’ has not been,” Daly explained. There are so many things wrong with this statement it’s hard to wrap a sane mind around it. First; why should it matter what you hit your head against, you still hit it. Secondly; “‘It’s the result of a study on our actual experiences over a number of years. ‘Ice’ has been found to be a predictor of concussions — ‘boards’ has not been.” You’re kidding right? This is probably the most bothering statement from the league’s higher-ups. As someone who has dealt with concussions from multiple sports, I’ve been an advocate for concussion awareness. It wasn’t until May of 2012 I started hearing about CTE. I started to read every single thing I could about it. Medical journals, articles from anyone and everyone writing about, I tried to find it all. It’s in the simplest of terms, a disease that causes your brain to degenerate over time due to repetitive brain trauma. It causes your brain to be permanently bruised and essentially changes the way your brain functions. Know the difference between the trauma caused from hitting the ice and hitting the boards? None. Not a single difference, it is trauma. Something I find really troubling and honestly disgusting about the league’s statement is that “A study” nonsense. The NHL doesn’t even help support CTE or brain injury research. In January it was discovered that of the NHL won’t even help fund the research of CTE. USA TODAY Sports’s Nancy Armour found that, in fact the only NHL related people helping are the NHL Players Association. “The NHL has not given money to any of the four centers leading research into neurodegenerative diseases, specifically the question of why so many football and hockey players develop chronic traumatic encephalopathy (CTE), USA TODAY Sports has found. Boston University, North Carolina, the National Institutes of Health and the University of Western Ontario all were asked for details about which sports organizations have helped fund their research, and the NHL was not mentioned in any of their responses. Countless number of times NHL Commissioner Gary Bettman has denied that there is any connection between concussions and CTE. He claims that “A causal link between concussions and CTE has not been demonstrated” and “the relationship between concussion and the asserted clinical symptoms of CTE remains unknown.” Yet, the NFL, who also fought CTE at the start thinks that there is a connection and has taken steps to help prevent and fund it. Yet, this is just the tip of the ice berg when it comes the NHL and head injuries. For once a big named like Crosby is bringing light to an issue the NHL doesn’t even believes exists. All of it brought out by that one statement from the NHL deputy commissioner Bill Daly. How long will it take for the NHL to understand that they have to take head injuries seriously? Which big star has to retire early due to concussions because the league’s lack of concussion supervision let him back on the ice? It is Crosby now, but what if it is Connor McDavid or Patrik Laine in the future?